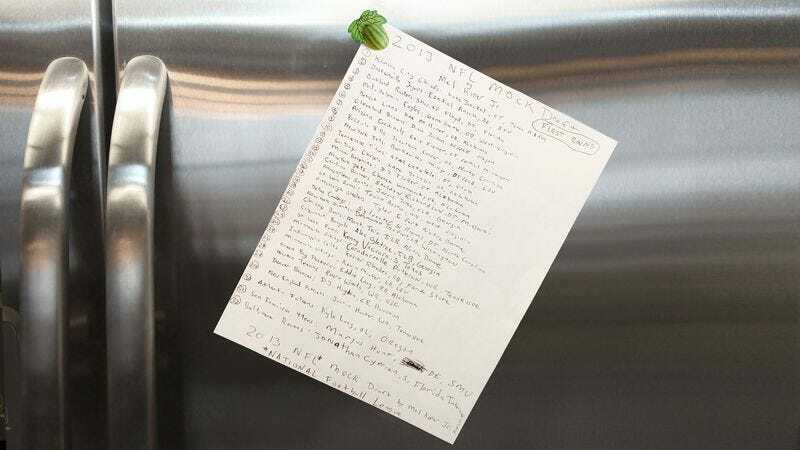 TOWSON, MD—Kim Kiper proudly displayed her husband’s 2013 NFL mock draft on the refrigerator door Wednesday, claiming that the 52-year-old football analyst worked very hard hand-writing a list of potential selections for every single team in the league. “Mel was so cute when he came running into the kitchen excited to show off the mock draft that he made all by himself,” said Kiper, adding that her husband is often content to sit on the floor of his room all day quietly pretending to choose draft picks for NFL teams. “The smile on his face was priceless when I told him that I was going to put it up on the fridge where everyone can see the good job he did. I’m very pleased that he didn’t have any tantrums this year. Sometimes he gets so frustrated after mixing up the draft order that he throws a fit and stomps around the house for hours.” Kim Kiper, who attempted to encourage and praise her husband, admitted to reporters that she had to help him make selections for picks five through 32.